Set of Dual Port manifolds for 40mm Kadron/Solex Carbs. Replace your old Steel ones with these new Aluminum ones. 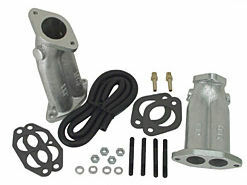 Comes complete with crossover hose, fittings, gaskets and hardware as seen.